Elizabeth Cady Stanton was one of the first leaders and theorists of the American women’s rights movement. She worked to revolutionize women’s lives on multiple levels: through the reform of marriage and laws, by challenging the dress code, lobbying to broaden women’s educational opportunities, and protesting the pernicious role of organized religion in women’s lives. She spearheaded the first women’s rights convention, in July 1848; she helped form the Women’s Loyal National League, the first national women’s political organization; and, working with Susan B. Anthony, she established the American Equal Rights Association (1866), which was dedicated to winning the ballot for African American men and all women. In 1869, also in partnership with Anthony, she formed the National Woman Suffrage Association. 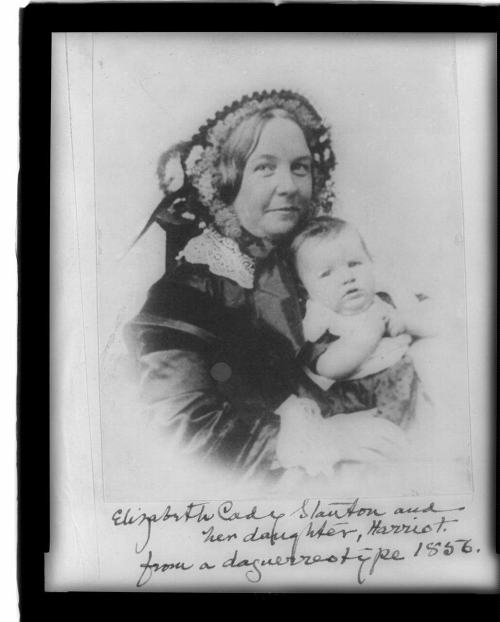 Elizabeth Cady Stanton, 1856. Library of Congress, Prints and Photographs Division, Washington, D.C.